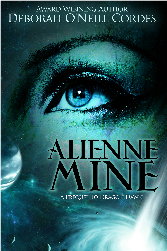 Alienne Mine is a prequel to Dragon Dawn, Book One of the Dinosaurian Time Travel Series ~ Deborah’s time twisting sci-fi romantic adventures. Interviews with Deborah O’Neill Cordes ~ Meyette's Musings Blog, Cait's Place Blog, The Write Way Café, Joanna Lloyd's Blog, M.J.Schiller's Blog. USA TODAY, Spotlight in Joyce Lamb's "Happy Ever After" column, Deborah O'Neill Cordes's Favorite Movies; USA TODAY, Dragon Dawn Spotlight in Joyce Lamb's "Happy Ever After' column; USA TODAY, Authors Share Their Dream Fangirl Moments. 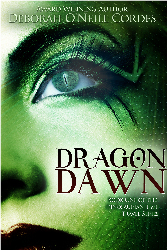 Dragon Dawn, Book One of the Dinosaurian Time Travel Series ~ Digital and Print Books Now Available on Amazon! Dragon Dawn ~ Finalist in the Pacific Northwest Writers’ Literary Contest, Semifinalist in the Novel Category in the William Faulkner-William Wisdom Creative Writing Competition. Conjurer ~ Finalist in the Screenplay Category, Pacific Northwest Writer’s Contest. The entire script was read and judged by industry professionals, which makes being a finalist such a great honor!